PINKDENIM3 - Style:off shoulder Design, Broken Denim Pants. Occasion:party, Casual, Holiday, daily, Take Photo. Note:this ia asian size, sometimes it will be smaller one size than US size, Please kindly check the size detail before you buy it. Size details: ▶ size 80, Shoulder*2:27cm/106" tops length:20cm/7. 8" pants length:40cm/15. 7" ▶size 90, shoulder*2:28cm/11. 0" tops length:22cm/8. 6" pants length:45cm/17. 7" ▶size 100, shoulder*2:29cm/11. 4" tops length:24cm/9. 4" pants length:50cm/19. 7" ▶size 110, shoulder*2:30cm/11. 8" tops length:26cm/102" pants length:55cm/21. 6" ▶size 120, shoulder*2:31cm/12. 2" tops length:28cm/11. 0" pants length:60cm/23. 3pcs Baby Girls Kids Off Shoulder Lotus Leaf Top Holes Denim Jeans Headband Outfits Set 3-4Y, Pink - 6" material:Cotton Blended+Denim. 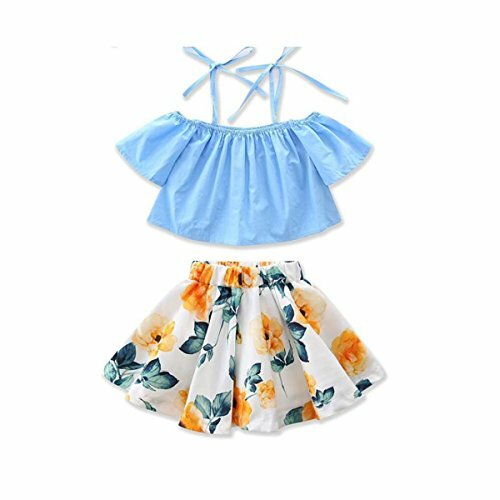 Kids grils 3pcs clothes set, very Vogue Design, Make Your Little Princess Have Different Style. BKFENSIMG2 - Design, fit for casual, photograph, cool, so fashion, party, great gift to baby, Daily and any occasion. Note:this ia asian size, sometimes it will be smaller one size than US size, Please kindly check the size detail before you buy it. Popular rose floral applique design, ruffle lotus edge. Size details: ▶ size 80, Bust:48cm/18. 9" tops length:32cm/12. 6" pants length:19cm/7. 4" ▶size 90, bust:50cm/19. 7" tops length:34cm/13. 4" pants length:20cm/7. 8" ▶size 100, bust:52cm/205" tops length:36cm/14. 2" pants length:21cm/8. 2" ▶size 110, bust:54cm/21. 3" tops length:38cm/15. 0" pants length:22cm/8. 6" ▶size 120, bust:56cm/22. 1" tops length:40cm/15. 3pcs Baby Girls Kids Off Shoulder Lotus Leaf Top Holes Denim Jeans Headband Outfits Set 3-4Y, Pink - 8" pants length:23cm/9. 0" material:Cotton Blended+Denim. Pecfect for casual dressing, Beach sunsuit, Holiday, Party, Photography, Birthday or other special occasions. - Great for daily wear or photograph. 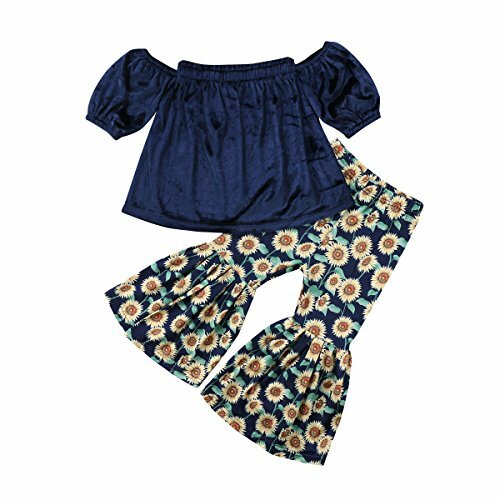 Age: 1-2y--top length: 30cm--bust*2: 21cm--sleeve: 16cm--pants: 49cm--18cm ✿ age: 2-3y--top length: 32cm--bust*2: 22cm--sleeve: 17cm--pants: 51cm--19cm ✿ age: 3-4y--top length: 34cm--bust*2: 23cm--sleeve: 18cm--pants: 54cm--20cm ✿ age: 4-5y--top Length: 36cm--Bust*2: 24cm--Sleeve: 19cm--Pants: 57cm--21cm ✿ Age: 5-6Y--Top Length: 38cm--Bust*2: 25cm--Sleeve: 20cm--Pants: 60cm--22cm Soft hand feeling, High quality, Not irritative baby's skin. Fashion design make your baby so cute. Fit for baby girl within 1-6 Years, Perfect gift in birthday party at summer, autumn. 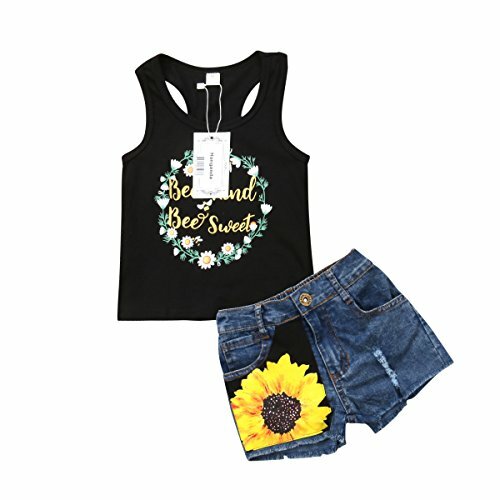 Features: off shoulder, short sleeve, tube top, ruffle pants with sunflower print. Package included: 1x Top + 1x Long Pants. - X1f339;size details please see in "Product Description", Adjustable shoulder strap, suit your baby well. X1f339;fashion style: cute baby girl outfits make your baby be a Princess, also a good idea for family photography, coming home gifts, birthday party, Great for shower gifts, commemoration days, and casual wear etc. X1f339;100% quality assurance: any support and service needed just please feel free to contact us, we guarantee 100% Refund or Replacement. X1f339;material: polyester;soft handling, comfortable and breathable to wearing, no any not irritating to your baby's skin. Dear customer, welcome to molyhua, wish you have a nice shopping here ♥ About us: We are a company specialized in Baby Kids Clothes for several years We have professional design team. 3pcs Baby Girls Kids Off Shoulder Lotus Leaf Top Holes Denim Jeans Headband Outfits Set 3-4Y, Pink - You will find the newest and fashionable style in our shop ♥ Size Chart: Size:12M---Label Size:80--Bust:40-58cm/15. 7-22. 8"--tops lengthNot including strap:21cm/8. 3"--skirt length:23cm/9. 1"--height:80cm size:2t--label size:90--Bust:42-60cm/16. 5-23. 6"--tops lengthNot including strap:23cm/9. 1"--skirt length:25cm/9. - Short sleeve/striped+black: Size 80: Top Length 37cm/14. 6", bust*2: 31cm/12. 2", sleeve length 10cm/3. 9", pants length 48cm/18. 9", advice age 1-2 years size 90: Top Length 39cm/15. 4", bust*2: 32cm/12. 6", sleeve length 11cm/4. 3", pants length 50cm/19. 7", advice age 2-3 years size100: Top Length 42cm/16. 5", bust*2: 34cm/13. 4", sleeve length 12cm/4. 7", pants length 53cm/209", advice age 3-4 years size110: Top Length 44cm/17. 3", bust*2: 36cm/14. 2", sleeve length 12cm/4. 7", pants length 56cm/22. 0", advice age 4-5 years size120: Top Length 46cm/18. 1", bust*2: 37cm/14. 6", sleeve length 13cm/5. 1", pants length 60cm/23. 6", advice age 5-6 years ★long sleeve/black+Blue: Size 80: Top Length 33cm/13. 3pcs Baby Girls Kids Off Shoulder Lotus Leaf Top Holes Denim Jeans Headband Outfits Set 3-4Y, Pink - 0", bust*2: 28cm/11. 0", pants length 38cm/15. 0", advice age 1-2 years size 90: Top Length 36cm/14. - Occasion: dressy, Everyday, Holiday and suit for going out to photograph. Long sleeve, tulle Overlay Lace Dress and headband, super cute clothing. Season: spring, summer, winter, Fall, All Seasons. Package included: 1x Jeans Jacket+Lace Dress. Size description: size 0-12months: length:34 cm bust: 27*2 cm Sleeve:30 cm Dress Length:20 cm Size 1-2 years: Length:37 cm Bust: 28. 5*2 cm sleeve:32. 5 cm dress length:22 cm size 2-3 years: length:40 cm bust: 30*2 cm Sleeve:35 cm Dress Length:24 cm Size 3-4 years: Length:43 cm Bust: 31. 5*2 cm sleeve:37. 5 cm dress length:26 cm size 4-5 years: length:46 cm bust: 33*2 cm Sleeve:40 cm Dress Length:28 cm Material: Demin+Lace. - Package included:1pcs white shirt +1pcs denim pants. Size 80, bust great for daily wear and outside play wear, for 12~18months, It would be a great gift for your baby. Cotton blend material, soft and breathable. Occasion: everyday, Autumn, Spring, winter. Please ignore the estimated delivery date, it usually takes 8-15 days for delivery. - Your little girl will get lots of compliments with this clothes set. Fit for twins girl, infant toddler kids little girl from 6 Months to 6 Years. Expedited shipping: by Fedex, 3-5 biz days to arrive. Trademark honganda, serial number is 87957688, Other sellers are not be authorized! Denim shorts outfit----------------- size 90 - Top Length 36cm/14. 2" - bust*2: 28cm/11. 0" - shorts length 21cm/8. 3" - advice age 1-2t size100 - Top Length 38cm/15. 0" - bust*2: 29cm/11. 4" - shorts length 22cm/8. 7" - advice age 2-3t size110 - Top Length 40cm/15. 7" - bust*2: 30cm/11. 8" - shorts length 23cm/9. 1" - advice age 3-4t size120 - Top Length 42cm/16. 5" - bust*2: 31cm/12. 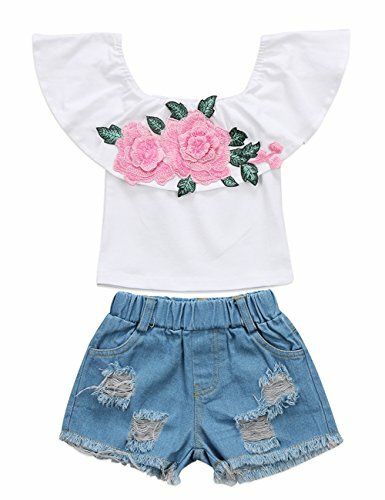 3pcs Baby Girls Kids Off Shoulder Lotus Leaf Top Holes Denim Jeans Headband Outfits Set 3-4Y, Pink - 2" - shorts length 24cm/9. 4" - advice age 4-5t size130 - Top Length 44cm/17. 3" - bust*2: 32cm/12. 6" - shorts length 25cm/9. 8" - advice age 5-6t --------------------------------------- --------------watermelon outfit----------------- Size 80 - Top Length 32cm/14. - 2. Please understand that the products maybe a little different from the photos in color. Suitable for casual, summer beach, birthday party, etc. Make your baby cute, attractive, with much attention all the time. Material: Cotton+Denim. 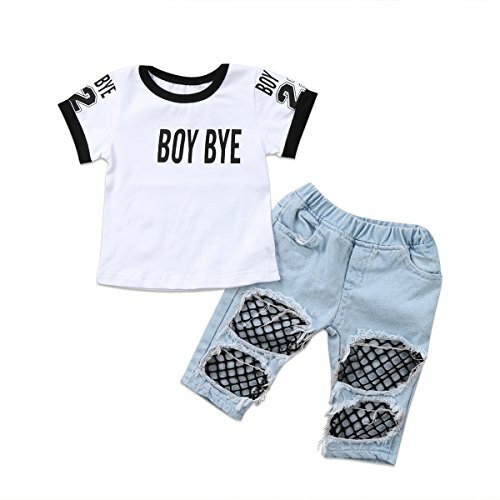 Features: 100% brand new and high quality kid baby princess girls boat neck shirt top & denim pants trousers suitable for casual, summer beach, etc 2pcs only, birthday party, any other accessories not included Material: Cotton+Denim Color: White | Camouflage Size: 1Y-2Y | 2Y-3Y | 3Y-4Y | 4Y-5Y | 5Y-6Y | 6Y-7Y Note: 1. The recommended age is just for your reference. Recommend age: 1-7 Years Old Girls. Please check the measurements to choose the right size for your baby! Meanwhile, please choose the larger size because babies at the same age may have different height. Thank you for your kind understanding! Package Includes 1 x Shirt 1 x Jeans Kid baby princess girls boat neck shirt top & denim pants trousers. - We ensure you will be delight to take this romper back home. It's a great gift for your cute baby girl, granddaughter, Nephew. Specially design for big sister and little sister. Super breathable and soft fabrics, skin-friendly, giving baby 100% skin care. Size DescriptionApprox. The white: size 90, tops length 43cm, bust*2 23cm, waist*2 22 cm, pants length 23cm, age 5-6 years size 130, bust*2 28cm, waist*2 23 cm, tops length 40 cm, age 3-4 years size110, bust*2 26cm, pants length 24cm, bust*2 29cm, age 4-5 years size 120, tops length 36 cm, bust*2 25cm, Waist*2 21 cm, Age 2-3 Years Size 100,, Waist*2 20 cm, Pants Length 25cm, Pants Length 22cm, Waist*2 19 cm, Age 6-7 Yeras NOTE: Compare the detail sizes with yours, Tops Length 38 cm, Pants Length 21cm, Tops Length 42cm, please allow 1-2cm difference due to manual measurement. Package include:Vest Tops+Short Pants+Headband. Fit for newborn baby girls within 7 Years, It must be wonderful summer outfits for your baby. Tassels and sleeveless Design. - Size chart age12-18m--tag 80---Chest106"-dress Length209"-pants Length17. 3" age18-24m--tag 90---Chest11. 0"-dress Length21. 7"-pants Length18. 1" age2-3t--tag 100--Chest11. 4"-dress Length22. 4"-pants Length18. 9" age3-4t--tag 110--Chest11. 8"-dress Length23. 2"-pants Length19. 7" age4-5t--tag 120--Chest12. 2"-dress Length24. 0"-pants Length205" package content: 1x dress Top 1x Horn Pant Material: Cotton Blend. Occasion: daily;photo Outfit;Party;Birthday Party;Fall;Winter;Spring;Summer. White&black Stripped Pant with elastic waist. No shrinkage. Hand-wash and Machine washable. Package included: 1x Top Dress +1 x Pants. Feature: ruffles sleeve irregular Mini Dress Tops.